As long as I live I will never forget what God did with some committed Christians in the First State. 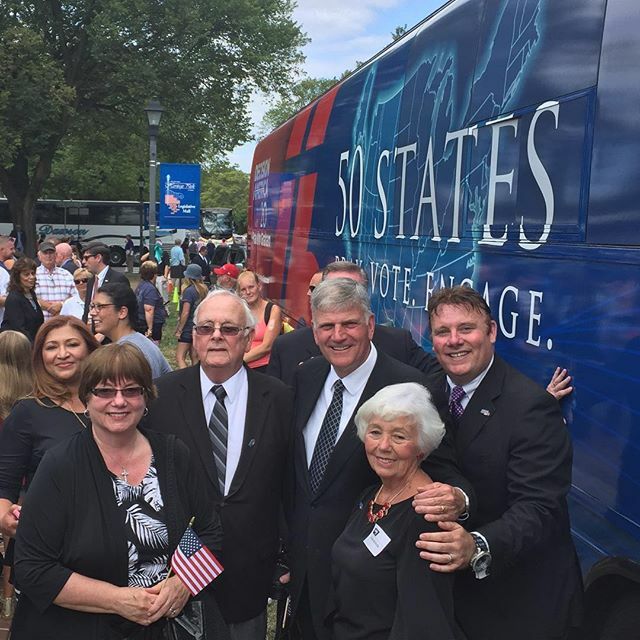 Earlier this month, Franklin Graham’s DECISION AMERICA TOUR bus rolled into town and GOD showed up! The back story was for the first time in decades the Billy Graham Evangelistic Association felt led to scrap all of their planned overseas crusades and focus on home. Franklin Graham saw the direction the country was going and it was not good and definitely not God. He felt led to visit in person ALL 50 states and even his father, Dr Billy Graham never hit all 50 states speaking in one calendar year. The good news is it was an honor to be a part of this huge undertaking. The bad news is I was the only one assigned a state capital that I don’t even live in. However, God knew what He was doing and that made us all depend more on Him. Even in ministry we can get comfortable which leads to complacency or worse growing cocky. Neither of them are the fruit of the Spirit and yes relationships are important but if you rely on your rolodex of friends more than the Redeemer by faith it is a disaster waiting to happen. In the words of the “Smokey & The Bandit” theme song, “We Had a Long Way to Go and a Short Time to Get There!” Delaware was approximately 120 miles each way from my home. While trying to connect with pastors, civic leaders and concerned citizens it is hard to converse if you are not in front of them. Yes, social media and telephone make the world smaller but nothing like being in front of someone, looking them in the eye and spending time together. While working the phones we had little initial success. It was getting discouraging to say the least but we kept praying and persevering. I had the honor to grow as friends with Pastor Walter Smith. He is an 80 year old pastor and still on the front lines serving God. He and his amazing wife are pastoring a dozen people and he invited me to preach at his country church. He didn’t think I would come but I was honored by the invite and I drove over 200 miles to preach at a church that is over 225 years old and whose pastor is just shy of a century! If he could do it every week then I not only could but should. We had ONE profession of faith that week and we both were HIGH as a kite! While following up with Pastor Smith as we were on the phone this saintly senior put me on hold to take another call. He returns sharing it was the former Director of Missions for entire state of Delaware. That pastor running a baker’s dozen then connects me with the retired DOM who is now pastor of a growing Baptist Church. That pastor and I connected and he graciously opened his pulpit to share to his people and then these two clergy decided to think out of the box and partnered with two other clergy from other churches and we had a mini city wide crusade in Dover, DE. Just before all that transition the pastors of Maranatha Life Changing Church and also hosts of the annual Delaware “March For Jesus” had me graciously come preach at their church. Pastor Ennio & Maribel and their church are SECOND to none! They were INCREDIBLE in their selfless service to us and they not only rolled out the red carpet but girded themselves with an apron and like Christ served the mission non-stop. What are the odds? Their church is home base every year for the March For Jesus and folks from all over the state meeting at their facility and walk to the state capital and on the front lawn have their rally. They invited me to be the keynote speaker on the very spot where Franklin Graham would return a couple months later. John The Baptist was the forerunner to Christ but lately I have been blessed to be the forerunner to the world’s most beloved evangelist’s son! One of my early visits to Delaware was meeting with three other pastors. Two of those three from the very beginning served around the clock and we couldn’t have asked anymore of them. One of the pastors serves on the board of the most popular Christian radio station (88.7 – The Bridge) and they graciously ran FREE radio ads for us promoting the upcoming rally for three months! Shout out to Bill Sammons and his staff! They rock for The Rock! The pastor also connected me with Nicole Theis who is the Director of Delaware Family Research Policy Council and she is hands down one of the most gifted, organized and patriotic person I have had the honor to meet. Between her assistance and knowledge of Delaware and working alongside John Radell – Director of Faith and Freedom for Delaware the two of them got it done! So thankful for their non stop service and passion for God and Country. We continued to encourage pastors and leaders to come together and we packed out the Hilton Garden Inn for a leader luncheon and the VP of BGEA came as our keynote speaker. Steve Rhoads did a tremendous job and I heard scores of pastors share with me that his message ministered to them! As we continued to pray, promote and encourage all to participate God moved in our midst! We nearly DOUBLED the crowd that BGEA were hoping for and it was a beautiful sight to see a sea of people come together. Churches united, denominations were no longer divided and we are still seeing and hearing stories of clergy coming together for fellowship and I have encouraged them to swap pulpits in future Sunday services. Folks are already considering hosting revival meetings this Fall and Christians are on fire! Click below to watch video that BGEA made with a clip chronicling Franklin Graham’s trek across the Country. It is powerful! To date, over 5,000 people have made professions of faith at the prayer rally and I have never not seen the Graham Family fail to extend an invitation after preaching the Gospel. Franklin is coming to Annapolis, MD on Oct 11 and Richmond, VA on Oct 12. As the rally drew closer we even went to an empty lawn on Legislative Mall and filmed a video (below) encouraging folks to come. Thanks to David and Kelly Mooreman and Gina for assisting and we put on Facebook and within a week reached several thousand views! We went to the empty lawn BY FAITH and believed God would fill it. The Lord still answers prayers and you can see below what God did with a team of selfless saints desiring to serve the Savior! We had nearly 400 students from various Christian schools in Delaware treat the prayer rally as a field trip and attend the prayer rally. Nicole was instrumental in bringing Delmarva Christian to the event and Franklin took a pic with them and now on the school’s website! What an honor it was for me to introduce Franklin to my wife, parents and Aunt Elaine. Mom while meeting him thanked him for being a “defender of our faith.” So blessed to be a small part of what God continues to do with the Billy Graham Evangelistic Association and we encouraged folks all over the state, “DON’T MISS THE BUS!” When Franklin’s bus rolled into town on September 13th I am so proud that very few did. In the New Testament, God used a lad’s lunch and fed five thousand. He used a widow’s mite and recently a Marylander connecting with dedicated Delawareans and God did the rest! The folks of Delaware will always have a special place in my heart and one of my greatest honors is growing as friends with these fine folks. To God be the glory – great things HE hath done. 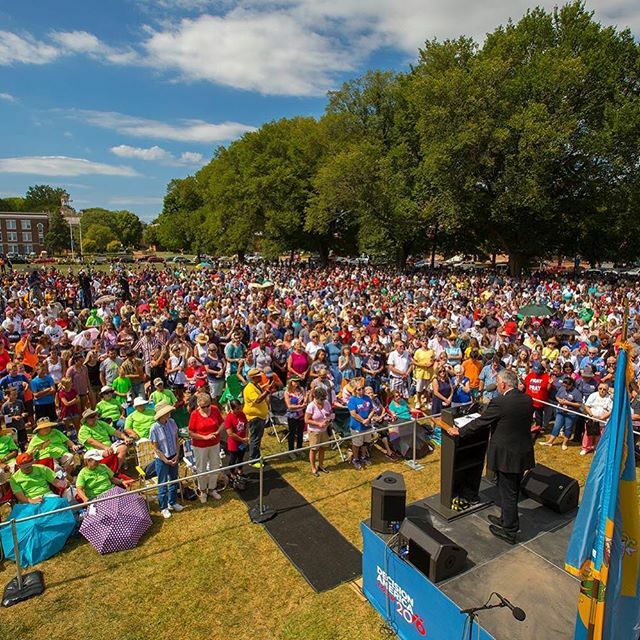 Today, we stood together to reclaim hope for Delaware. Franklin Graham was “BRING’N IT”!!! To see 3000 people gathered, praying, and hearing the powerful words prayed over our state today… it was spiritually significant in our history. How grateful I am to have worked with Frank Shelton. Be sure to check out the photos on Delaware Family Policy Council page and what Franklin Graham just posted on Instagram. Wow love it for a low evangelical population this is unreal! !